The 5th Infantry Division was a regular army infantry division of the British Army. It was established by Arthur Wellesley, 1st Duke of Wellington for service in the Peninsular War, as part of the Anglo-Portuguese Army, and was active for most of the period since, including the First World War and the Second World War and was disbanded soon after. The division was reformed in 1995 as an administrative division covering Wales and the English regions of West Midlands, East Midlands and East. Its headquarters were in Shrewsbury. It was disbanded on 1 April 2012. The 5th Division during the Peninsular War under the command of General James Leith was present at most of the major engagements including the Battle of Bussaco, the Battle of Sabugal, the Siege of Almeida, the Battle of Badajoz, the Battle of Salamanca, the Battle of Vitoria, the Siege of San Sebastian, the Battle of Nivelle and the Battle of the Nive. Black Watch at Quatre Bras. The division was also present during the Waterloo Campaign first seeing action at the Battle of Quatre Bras then at the Battle of Waterloo under the command of Lieutenant General Sir Thomas Picton. 42nd (Royal Highland) Regiment of Foot "Black Watch"
The 5th Division under the command of General Sir Charles Warren joined up with the Natal Field Force shortly after the Battle of Colenso and were a part of the relieving army of the besieged Ladysmith. 11th Infantry Brigade initially commanded by General Edward Woodgate but he was wounded at Spion Kop and died shortly afterwards. He was succeeded by General Arthur Wynne who was later wounded at the Battle of the Tugela Heights and succeeded by Colonel Walter Kitchener. 10th Infantry Brigade commanded by General John Talbot Coke. Men of the 12th (Service) Battalion, Gloucestershire Regiment ("Bristol's Own") moving up in support in open order near Ginchy, France, 25 September 1916. The 5th Division was a permanently established Regular Army division that was amongst the first to be sent to France as part of the original British Expeditionary Force (BEF) at the outbreak of the First World War. It served on the Western Front for most of the war except for a brief period in Italian Front. The 5th Division, as a Regular Army formation (one of the Old Contemptibles) fought in many of the major battles of the Western Front from the Battle of Mons in 1914, the later stages of the Somme offensive, including the first battle using tanks, up to the Battle of the Selle in 1918. 13th Brigade The 13th Brigade was temporarily under the command of 28th Division between 23 February and 7 April 1915, when it was replaced by 84th Brigade from that Division. 15th Brigade The 15th Brigade was temporarily under the command of 28th Division between 3 March and 7 April 1915, when it was replaced by 83rd Brigade from that division. The 5th Division was unusual among other British divisions in that no battle patches were worn on their tunics or helmets, aside from those briefly worn by New Army battalions bringing them from their former division. Men of the 2nd Battalion, Royal Inniskilling Fusiliers disembarking at Cherbourg, France, from the steamer 'Royal Sovereign', 16 September 1939. A 25-pounder of 361 Battery, 91st Field Regiment, Royal Artillery, at Oppy near Vimy, France, 7 January 1940. Upon the outbreak of the Second World War, in September 1939, the 5th Infantry Division was a Regular Army formation, commanded by Major-General Harold Franklyn, who had been in command since 1938. The division was based at Catterick under Northern Command. Both of its infantry brigades (the 13th and 15th) went to France to join the rest of the British Expeditionary Force (BEF) in early October 1939 as independent infantry brigades, but the divisional Headquarters crossed to France on 19 December 1939, coming under the command of Lieutenant-General Alan Brooke's II Corps from 23 December. By the new year of 1940 the division was reformed with three infantry brigades –the 13th, 15th and 17th, all commanded by men who would achieve high rank in the next few years. The 13th was commanded by Brigadier Miles Dempsey, the 15th by Brigadier Horatio Berney-Ficklin, and the 17th by Brigadier Montagu Stopford. Throughout the early months of 1940 the division saw some changing of units, as the Territorial Army (TA) divisions began to arrive in France from the United Kingdom. This was part of official BEF policy, based on experience from the Great War, and was intended to strengthen the inexperienced TA formations with experienced Regulars, although at the same time diluting the strength of the Regular divisions with inexperienced TA units. Despite this, the division still maintained its integrity as a Regular formation. The next few months were spent in training, although this was hampered by severe shortages of modern equipment. Due to the lack of immediate action many soldiers believed the war would amount to very little. Despite this, morale in the division was high. This period of inactivity was known as the "Phoney War". 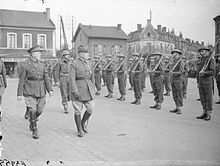 General Alphonse Georges of the French Army, accompanied by General Lord Gort, Commander-in-Chief (C-in-C) of the BEF, inspecting men of the 2nd Battalion, Royal Inniskilling Fusiliers at Bethune, France, 23 April 1940. In mid-April the 15th Brigade was sent to Norway and fought, very briefly, in the unsuccessful Norwegian Campaign, evacuating from there and arriving in the United Kingdom in early May, but did not rejoin the 5th Division until 3 July 1940. In early May the 25th Infantry Brigade came temporarily under command of the division in France. The German Army launched its attack in the West on 10 May 1940 and the 5th Division saw action in the battles of Belgium and France in May–June 1940 including the Battle of Arras, supported by the 1st Army Tank Brigade, on 21 May 1940 and at the Battle of the Ypres-Comines Canal from 26 to 28 May 1940, and then was withdrawn to Dunkirk, along with the rest of the BEF, where they were evacuated to England, with most of the division arriving on 1 June. Lieutenant-General Brooke, commanding II Corps, wrote in his diary that there "is no doubt that the 5th Div in its fight on the Ypres-Comines canal saved the II Corps and the BEF". The division, having sustained very heavy losses, remained in the United Kingdom for the next 21 months, with most of 1940 being spent in Scotland under Scottish Command, reforming in numbers and being brought up to strength with large numbers of conscripts, alongside training in anti-invasion duties and preparing for Operation Sea Lion, the German invasion of the United Kingdom which never arrived. In late March 1941 the division, now under the command of Major-General Horatio Berney-Ficklin, who had taken over in July 1940 (and previously commanded the 15th Brigade), was sent to Northern Ireland, coming under command of Lieutenant-General James Marshall-Cornwall's III Corps, under overall control of British Troops Northern Ireland, and, as in Scotland, continued training to repel a German invasion there (see Operation Green). An infantry section of the 6th Battalion, Seaforth Highlanders, creep forward during exercises at Crum Castle in County Fermanagh, Northern Ireland, November 1941. The division left Northern Ireland on 16 March 1942 and served and travelled in so many regions of the world that they were known as the Globe Trotters, and became the most travelled division of the British Army during the Second World War. In April 1942 the 13th and 17th Infantry Brigades and a portion of the divisional troops were detached to 'Force 121' for Operation Ironclad, the invasion of Vichy French held Madagascar. The division was not complete again until August 1942. It was sent from the United Kingdom to India for three months and then to Middle East Command, where it spent time under the command of British III Corps, now under Lieutenant-General Desmond Anderson, as part of the British Tenth Army, under overall control of Persia and Iraq Command, where it trained in mountain warfare. In mid-February 1943 the division was sent to Syria, remaining there for the next four months, and later Egypt, where it came under the command of British XIII Corps, commanded by Lieutenant-General Miles Dempsey (who earlier had commanded the 13th Brigade in France and Belgium in 1940), which was part of the British Eighth Army, under General Sir Bernard Montgomery. The division, serving again alongside the 50th Division, began training in amphibious operations in preparation for Operation Husky, the Allied invasion of Sicily. Universal carriers of the 2nd Battalion, Wiltshire Regiment pass through Pedara, Sicily, 9 August 1943. The 5th Division saw action during the invasion of Sicily where, towards the end of the campaign, in early August, the divisional commander, Major-General Berney-Ficklin, who had commanded the division since July 1940, was replaced by Major-General Gerard Bucknall. The division was pulled out of the line and absorbed replacements, and invaded the Italian mainland in Operation Baytown on 3 September (four years since Britain's entry into the war), still as part of XIII Corps of the Eighth Army, but now serving alongside the 1st Canadian Infantry Division, and advanced up the spine of Italy. Later in the year, the division fought in the Moro River Campaign, although sustaining relatively light casualties in comparison to the other Allied formations involved. Men of the 2nd Battalion, Cameronians (Scottish Rifles) climbing a track in mountainous terrain, Italy, 21 November 1943. Infantrymen of the 1st Battalion, Green Howards trudge down a snow-covered hillside, Italy, on New Year's Day, 1 January 1944. Progress for the Allied Armies in Italy (AAI), commanded by General Sir Harold Alexander, towards the end of 1943 had slowed down considerably, due mainly to a combination of worsening weather, stiffening German resistance and the Winter Line (also known as the Gustav Line, a series of formidable defences the Germans had created). The Eighth Army, operating on the Adriatic coast, had already pierced the Gustav Line at its eastern end. However, the appalling weather conditions forbade further progress and so operations there were closed down. As a result, the relatively intact 5th Division was available elsewhere. Therefore, in early January 1944 the division was transferred from the Eighth Army, now under Lieutenant-General Sir Oliver Leese, to the western end of Italy to join Lieutenant-General Richard McCreery's British X Corps. X Corps, stationed along the Garigliano river, was part of Lieutenant General Mark W. Clark's U.S. Fifth Army at the time. The division, now commanded by Major-General Philip Gregson-Ellis and with the veteran 201st Guards Brigade under command, crossed the Garigliano river as part of the First Battle of Monte Cassino. In March 1944 the division, after holding its positions that it gained during First Cassino, was transferred again, this time to the Anzio bridgehead (or, more appropriately, beachhead) where they came under command of Major General Lucian Truscott's U.S. VI Corps and relieved the battered 56th Division, which was returning to the Middle East. Although by this time the major battles for the Anzio beachhead were over, the division was involved in minor skirmishing and operating in conditions more reminiscent of the trench warfare of the First World War. In May the division participated in Operation Diadem and the breakout from Anzio, which led to the capture of the Italian capital of Rome in early June. During the fighting, Sergeant Maurice Rogers of the 2nd Battalion, Wiltshire Regiment was posthumously awarded the Victoria Cross, the first and only to be awarded to the 5th Division during the Second World War. Soon afterwards the division, having sustained just under 3,000 casualties since its arrival at Anzio three months before, was then withdrawn to Palestine, arriving there in mid-July. The division came under command of Persia and Transjordan Command. Infantrymen of the 2nd Battalion, Royal Scots Fusiliers advance in single file during operations to outflank German resistance in Uelzen, Germany, 16 April 1945. The division, now commanded by the relatively young Major-General Richard Hull, who, at the age of 37, was the youngest division commander in the British Army (and later destined to become Chief of the General Staff), returned to Italy in early 1945 where they relieved the British 1st Infantry Division, which had fought alongside the Globetrotters at Anzio. Soon afterwards, however, the division was transferred to the Western Front in March 1945 to participate in the final stages of the North West Europe Campaign. Arriving in Belgium just after the British crossing of the Rhine, the division came under command of VIII Corps, under Lieutenant-General Evelyn Barker, part of the British Second Army, under Lieutenant-General Miles Dempsey, and took part in the Western Allied invasion of Germany, closely supported by elements of the 6th Guards Armoured Brigade. Throughout the Second World War, the British 5th Infantry Division used a 'Y' on a khaki background as its insignia. The 5th Division was disbanded in 1946 and was reformed briefly from the 7th Armoured Division in Germany on 16 April 1958, with the 7th and 20th Armoured brigades but was then redesignated the 1st Armoured Division on 30 June 1960. It was again reformed in the United Kingdom on 1 April 1968, under Army Strategic Command, incorporating the 2nd, 8th, and 39th brigades, but disbanded in 1970. The 5th Division was reformed as an administrative division – effectively a military district – from North West, Wales, and Western Districts on 1 April 1995. It had administrative control over a wide range of regiments, training establishments and cadet corps. It had its permanent headquarters at the Copthorne Barracks in Shrewsbury, Shropshire. The division was in charge of the majority of British Army units in Wales, the English West Midlands and South West England. The South West was transferred to the 4th Division, replaced by the East Midlands and the East English regions. The division therefore covered the central regions of England as well as Wales. The 5th Division took command of Headquarters Salisbury Plain Area and 43rd (Wessex) Brigade from 3rd Division on 1 April 1999, and 107 (Ulster) Brigade also fell under its responsibility. However, 107 Brigade was shifted back under HQ Northern Ireland, at a later date. HQ 43rd Brigade moved to Bulford by 1 September 1999, and HQ Salisbury Plain Area disbanded by that date. This process freed Headquarters 3rd (UK) Mechanised Division from its administrative and regional responsibilities and it become a deployable or "fly-away" division. The division reported to Army Headquarters at Andover. The new HQ Support Command in Aldershot began operation in January 2012 when HQ 4th Division in Aldershot disbanded. HQ 2nd Division in Edinburgh and HQ 5th Division in Shrewsbury were both disbanded in April 2012. 16th Air Assault Brigade – operationally independent formation that, because its Headquarters is at Colchester, fell under purely administrative command of 5th Division. ^ a b "The Battle of Waterloo". Retrieved 2 February 2013. ^ "Ladysmith history and the Boer War". Retrieved 2 February 2013. ^ "The Battle of Val Krantz and Pieters". Retrieved 2 February 2013. ^ a b c "The 5th Division in 1914–1918". Retrieved 2 February 2013. ^ a b c d e f g h i j k l m n o p "badge, formation, 5th Infantry Division". Imperial War Museum. Retrieved 2 February 2013. ^ "Miles Dempsey". Generals.dk. Retrieved 19 April 2017. ^ "Horatio Pettus Mackintosh Berney-Ficklin". Generals.dk. Retrieved 19 April 2017. ^ "Montagu Stopford". Generals.dk. Retrieved 19 April 2017. ^ "Journey of the Globetrotters' by Dennis March". BBC. Retrieved 1 September 2016. ^ "5th Division". Battlefields. Retrieved 15 August 2015. ^ "9 Fd Rgt at RA 1939–45". Archived from the original on 24 September 2015. Retrieved 8 February 2015. ^ "Rgt at RA 1939–45". Archived from the original on 22 August 2004. Retrieved 8 February 2015. ^ "Rgt at RA 1939–45". Archived from the original on 24 September 2015. Retrieved 8 February 2015. ^ "18 LAA Rgt at RA 1939–45". Archived from the original on 24 September 2015. Retrieved 8 February 2015. ^ "British Army of the Rhine". Retrieved 2 February 2013. ^ "TA Command Structure 1967 – 2000". Archived from the original on 8 June 2011. Retrieved 2 February 2013. ^ "New Army's HQ Land Forces base is opened in Andover". BBC News. 9 September 2010. Retrieved 2 February 2013. ^ "No. 27436". The London Gazette. 23 May 1902. p. 3384. Maj A.F. Becke,History of the Great War: Order of Battle of Divisions, Part 1: The Regular British Divisions, London: HM Stationery Office, 1934/Uckfield: Naval & Military Press, 2007, ISBN 1-847347-38-X. Lt-Col H.F. Joslen, Orders of Battle, United Kingdom and Colonial Formations and Units in the Second World War, 1939–1945, London: HM Stationery Office, 1960/Uckfield: Naval & Military Press, 2003, ISBN 1-843424-74-6. Von Pivka, Otto (1973). The Black Brunswickers. Osprey Publishing. ISBN 978-0850451467. Watson, Graham (2005). The British Army in Germany: An Organizational History 1947–2004. Tiger Lily Publications LLC. ISBN 978-0972029698. Gregory Blaxland, The Regiments Depart: A History of the British Army 1945–70, William Kimber, London, 1971. Hussey, A.H.; Inman, D.S. (1921). The Fifth Division in the Great War. London: Nisbet and Co. This page was last edited on 26 September 2018, at 10:37 (UTC).